Climate change is a tough subject. It is serious and it is scary. Dig deep – beyond the very real, devastating impacts on communities around the world – and what you find is the reality of global systems of inequality. Legacies of colonial extraction. Concentrations of corporate wealth and political control. Policies based on homogenization, racism, and xenophobia. And yet, I am not downtrodden. I refuse hopelessness. Thousand Currents has learned some important lessons from over 30 years of solidarity with visionary grassroots leaders, groups, and social movements. People most impacted by climate crises also have solutions to address these crises. Through Thousand Currents’ long-term partnerships, I know that grassroots climate solutions – that reflect real people’s social, cultural, geopolitical and economic realities simultaneously – are not only possible, they already exist. The very people whose daily lives are impacted most – Indigenous Peoples, small scale farmers, fisherfolks, pastoralists, land stewards to name a few – are taking on these social and environmental injustices and turning them into actions that inspire me, and can inspire you. LESSON #1: Grassroots solutions demonstrate climate resiliency. When climate-related disasters hit, grassroots groups like Nari Chetana Kendra, or the Women Awareness Center Nepal (WACN), have predicted the precise infrastructural collapses and are able to respond to the hardest-hit areas that are missed (or even created) by top-down development efforts. In Guatemala City, for example, our partner Instituto para la Superación de la Miseria Urbana de Guatemala, or the Institute for Overcoming Urban Poverty in Guatemala (ISMUGUA), has built a network of 22 community organizations that have developed evacuation plans and family emergency plans for recurring climate disasters. Since communities are already living in highly vulnerable conditions, ISMU is also strengthening their efforts in regards to housing rights, education, and health to mitigate the longer-term effects of climate change. This led to a national housing law that addresses the right to dignified, healthy and adequate housing, as part of a long-term recovery strategy to disasters. Time and time again, we have seen that when community based organizations have the capacity for collective decision-making, resource generation, and rapid response, they are resilient through any form of crisis – climate, political or economic. LESSON #2: The power of grassroots solutions comes from the power of community organizing. Around the world, people who fight for our rights to water, soil, air, seeds, food, forests, livestock and land are facing magnificent odds. Recent assassinations of people like Berta Caceres in Honduras remind us that lives are literally on the line for climate justice, for local knowledge and viewpoints to be respected within “development” agendas. One such idea is food sovereignty, which not only regards food as having economic value but as containing cultural knowledge; food as medicine; and food as glue for social relations. Bernard Guri of the Centre for Indigenous Knowledge and Organizational Development in Ghana says food production in Africa integrates elements of spirituality, democratic participation, peace, rights of nature, self-determination, sensuality, justice, and human dignity. From Thousand Currents’ partners, we have learned about the power of organizing communities to not only adopt agroecological methods that support food sovereignty, but to support people to grow in their consciousness, to do the lasting work of decolonizing minds and challenging our notions of human supremacy – to imbue life with balance and harmony with ecological systems. To our partners in Chiapas and in rural Guatemala, this balance and harmony exists within an indigenous comosvision of Buen Vivir or well-being of all living beings. Grassroots organizing not only achieves such well-being at the local level but, in case after case, builds the political pressure for national, regional, and international change as well – from seed laws to economic policies to transformative social change. LESSON #3: Grassroots innovators are the rightful peers of climate scientists and global policymakers. If global leaders and funders continue to only invest in short-term projects conceived and designed by outside “experts”, or in market-based responses to climate change like carbon markets, we risk protecting only special or limited interests. Too often those of us with resources fail to recognize the technical prowess and complex innovation at the core of effective grassroots efforts. But Thousand Currents partners utilize the scientific method in a way that builds power and respects culture, identity, dignity and integrity of local processes. They also apply this approach to the Sustainable Development Goals. We can no longer risk dismissing grassroots solutions as quaint feel good projects on the sidelines. Nari Chetana Kendra, or the Women Awareness Center Nepal (WACN) is a network of 40,000 rural women. There was a reason they were the first respondents when the devastating earthquake hit in April 2015 – faster than most government and international actors. Because for 20 plus years, WACN had been building collective decision making processes through their 40 plus cooperatives where women farmers who earn less than $2 a day have over $4 million (yes – that figure is right!) of their own assets in circulation. WACN are our rightful peers of international “experts” they consider themselves asset builders for their communities, peer philanthropists to each other, and not just grant seekers. LESSON #4: Movement organizations are compelling us to reexamine the notion of scale. Scale for the sake of scale can crowd out lasting impact. So quality and effectiveness is paramount for us at Thousand Currents. Scale that matters most is that which has impact at the local level but also bolsters local organizations’ capacity to affect change at the global level. 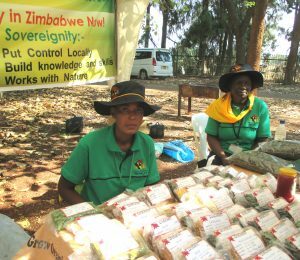 For example, in Zimbabawe, our partner Zimbabwe Smallholder Organic Farmers’ Forum (ZIMSOFF) promotes seed saving and agroecology practices that enhance resilience to climate change. The immediate results? Long-term food security for more than 500 rural farmers and their families, while also preserving biodiversity and depth. ZIMSOFF also hosts the international secretariat for La Via Campesina, a social movement of 200 million peasant farmers worldwide. It teaches us never to underestimate the power of a small grassroots organization or networks to have global impact. In Rajasthan, our partner Sahyog Sansthan works in over 100 indigenous communities in an semi-arid part of India where rainfall is becoming less and less predictable. Sahyog accompanies local communities to improve crop yields and manage communal lands more equitably and efficiently. They also use watershed management to train communities to plan agricultural cycles over a period of several years. When protecting ground water reserves, they eliminate the need for bore wells, which increase the likelihood of drought in the future. Though the transformation process for communities to focusing on meeting the food and fodder needs of everyone is long, Sahyog’s lasting results have inspired local government agencies to replicate its methods, reaching thousands more people than they could as one organization. Sometimes it takes a while for the world to take note of innovations already brewing and getting fine tuned on the ground! 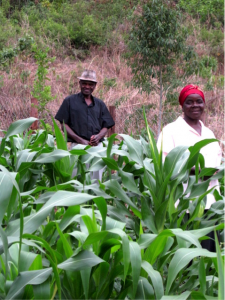 The Alliance for Food Sovereignty in Africa’s last convening had attendees who represented over 300 million small scale farmers, food producers and consumers across the continent – all concerned about the future of food. 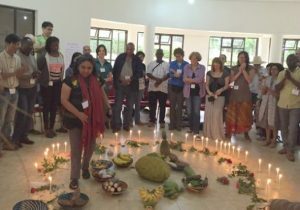 The Indigenous Terra Madre, held in Meghalaya, India in November 2015 was an unprecedented five-day gathering that brought together over 600 people and 170 indigenous communities from 62 countries devoted to the knowledge and cultural rights of indigenous peoples and the rights of Mother Earth. Those gathered at these meetings, far beyond the “usual players” convey the “scale” needed to see real social transformation. LESSON #5: This is a moment of unprecedented opportunity – calling for our fiercest solidarity and interdependence. It is critical that we are sharing information amongst ourselves and inviting people interested in gender justice, environmental justice, economic development and labor rights to begin to see food sovereignty as “their” issue as well. I am delighted to be a part of two such funder collaborations – the Agroecology Fund and the CLIMA (Climate Leaders In Movement Action) Fund. Both collaborative funds aim to leverage the singular power of foundations into a collective effort to amplify, resource, advocate and build the power of people on the frontline fighting for climate and food justice. The Agroecology Fund has evolved during 5 years of experimentation and works to support agroecology as a practice; to advance the science of agroecology and remove the social license from industrial agriculture; and strengthen agroecology movements across the world. The fund supports strategies as diverse and complementary as researching soil carbon sequestration, creating agroecology schools, passing local land and water use ordinances, and resisting corporate control of seed systems. There is no silver bullet solution to the climate crisis, or the global food crisis, or the global inequality crisis. With vested corporate interests and disregard of local knowledge, it is going to be important in this immediate future to invest in collaborative initiatives that nurture and promote the idea and practices of interdependence, not only amongst organizations and movements, but in fact, throughout our global ecosystem. Let’s not despair, but take action in solidarity with visionary grassroots leaders. The solutions are already in our midst.